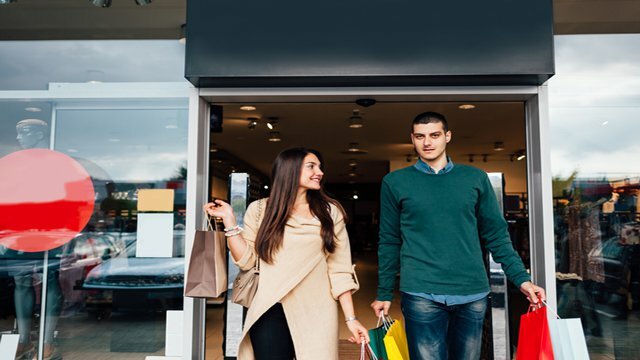 Retailers making the transition from clicks to bricks, or visa-versa, will know of the power that comes when you pair digital interaction with the offline world. Consumers are increasingly digitally savvy and expect an omnichannel retail experience. Many retailers are choosing digital signage as a secondary sales tool that can provide information, wayfinding and sell products — without them having to do a thing. When used correctly, digital a signage display can be tailored and flexible to the whims of customers, as well as being cost-effective to implement with high-impact results. Static signs and billboards are great, and cheap, but with 63 percent of people reporting that digital signage solutions catches their attention, it’s an area you can’t afford to ignore. Which is why in this post, I’ll be explaining how to nail the basics of signage solutions for your brick-and-mortar store. From creating effective playlists and schedules of content, to call-to-actions and wayfinding — all with the end goal of creating an in store experience that entices customers and reinforces brand perception. You can serve up a face-to-face experience that’s interspersed by rich digital experiences. When most retailers begin to think about digital signage displays, they’re tempted to fixate on the type of screen they’ll use. But here’s a secret: The real focus should be on what you put onto the screen. Digital content is often the first point of contact your customers have. It’s in the windows as they walk past the storefront and greets them as a physical salesperson as they enter the store. It’s also often positioned at crucial stop points around your store — in line, by their favorite items and as they leave. Create a story — Window displays that tell a story are able to turn heads and drive traffic through the doors. According to a study conducted at Princeton University, stories shape our thinking and response to what we see or hear. If you’re using digital signage within your windows, then it must tell the customer what value they will derive from walking through the doors. This can be achieved through video and image content, as well as text-based copy and quirky advertising displays. Use social media feeds to showcase social proof from your latest customers or proud testimonials from happy locals. Keep it simple — It’s tempting to go all out on your digital signage content in order to create something eye-catching. But a good rule of thumb is to keep things simple and let your message do the talking. Keep an eye on your digital signage displays to ensure they’re balanced in terms of color and layout. This means sticking to two or three primary colors and using white space to allow your message to pop. Compelling copy is essential in any marketing discipline and using five great words will entice customers more than 10 mediocre ones. Compelling composition — Think of your screens as though they’re a piece of art. Photography rules such as keeping darker elements near the bottom and lighter elements at the top will help you decide how to compose your screens. You can also use the headline-message-call-to-action rule to ensure your screens give a balanced message at just a glance. Contrast enticing visuals with compelling copy and colors that complement each other to attract eyeballs and get more focus on your business. Do you think digital signage is limited to digital screens? No way! Today’s brick-and-mortar store owner is faced with a host of options that can fit within any budget. As well as traditional screens and wall displays made out of sophisticated technology such as LED panels, retailers can also create digital signage out of tablets and mobile devices. Choosing what canvas to use will come down to a few factors. First is your budget. It’s much cheaper to implement a series of tablets at a few hundred dollars each than it is to install 20 or 30 screens. The second consideration is what type of experience you want to provide. A digital screen is great to attract eyes from all levels. It feeds out a strong message to all those in the store and can be positioned to aid wayfinding and provide customer support. Alternatively, a tablet positioned on a mount can provide an intimate experience where customers can browse and view information that seems as though it’s just for them. Tablets and mobile devices can also be used to entice the web-assisted shopper, allowing them to test, review and gain more knowledge of your products while still within your physical store. Once you have your content and canvas, the next step is to decide on what to play it and when. Most modern digital signage apps and players allow you to set up schedules and playlists that can be optimized for different times and days. This is where you can get clever with how you target your audience. If your biggest rush is first thing in the morning before customers go to work or school, perhaps you make your messaging snappy. Or you target products by what they might want to eat or drink at that time. If it’s the weekend, you could set up a separate playlist that accounts for a customer who has more time to browse. This could even extend to creating bespoke content for special occasions. For example, discounts that help shoppers before a big holiday and specific advertising for new products that suit the summer or winter months. Target your customers in-store as you would online and you’ll set up your digital signage displays for success. Your digital signage should be beautiful, but it can also be functional. Part of creating a customer journey that encourages customers to purchase products is making it easy for them to navigate. Digital signs can become your extra sales people, who navigate customers to specific areas. When your store becomes easy to navigate, your customers are more likely to rely on it. The advantage of digital signs over static signs is that you can change the information shown on them very easily and often without additional cost. When you want a layout change, your signs can adapt, too. When you have a special event or promotion in a specific area of your store, you can let customers know. This allows your internal structure to become more organized, providing customers with reassurance that whenever they visit your store, they’ll be able to find exactly what they need. How you position your digital signage will often determine what you show on it and when. Screens positioned to entice customers into the store should be bold, using compelling ad copy and bright colors that attract attention from the street beyond. Once customers are in the store, your digital signage can set the ambience and tone for their shopping experience. This could include more soothing messaging or informational and directional displays that help them get to where they need to be. Lastly, the screens that you use at key sales points, namely by your checkout area and as the customers leave the store, should incorporate some form of takeaway. This could be a call-to-action that invites them to visit your website or to share what they bought on social media. It could offer a discount if they refer a friend, or an invite for an event you’re holding in the near future. These digital signs are a key way of creating an additional touchpoint with your customers, keeping your business front and center of mind even once they have left the store. Creating digital signage displays that entice and delight is an ongoing, evolving model. But by focusing your attention on how you use your digital signs, where you use them and what content you show, you create a customer experience that’s relevant. When introducing or reviewing any type of digital signage, it’s important to take a step back and view it as if you are the customer. Often, it’s the finishing touches and the simplicities within the layout and order that can help you create enticing displays. Once you’ve achieved this, you can switch on your screens and step back — ready to welcome customers time and time again. The South African banking industry has been on the forefront of digital advances in the field of customer experience for many years. First National Bank’s level of digital innovation has recently attracted international attention, with the bank earning the title of Most Innovative Bank in the World at The Financial Global Banking Innovation Awards in October 2012. In today’s fast-paced world, the classic retail experience has not been forgotten, and banks are giving equal attention to ensuring the highest level of customer experience on both spectrums of service channel delivery. “We believe personal interaction and support is very important to consumers at a time when banks are moving more and more online, making their services faceless and impersonal,” Capitec Bank CEO Riaan Stassen stated last year, after rolling out the Qmatic Customer Flow Management Software (CFMS) solution nationwide. Speaking at the unveiling of the new Absa branch, Group Chief Executive, Maria Ramos, said the bank had chosen Hyde Park to showcase what it believes is a “game-changing retail experience”. The Hyde Park branch follows the model pioneered by the Absa Clearwater Mall branch. She added that the branch represents the “new face of traditional banking”. “We are proud to complement our digital offering with the Hyde Park branch that simplifies customers’ relationships with the bank and makes banking an easier and more enjoyable experience. “It is aimed at ensuring an enhanced customer flow management experience and supported by multi-skilled staff, technological improvements, innovative products and streamlined processes,” Ramos added. The unveiling included the Emerge Queue Qmatic CFM solution that utilises a Client Service Champion and ticketing system on arrival. “In essence, this allows the bank’s clients to relax in a lobby-like atmosphere until their ticket is called out,” says Eugene Swanepoel, Managing Director of Emerge Queue. According to Absa, its new modern banking branch will mean the end of long queues, even during traditionally busy periods. The bank also hopes to provide all the services a customer may need at a single counter, sparing them having to queue more than once. The Quick Service Kiosks allow customers to perform complex banking activities without the need to queue. Barclays Africa and Absa’s Head of Personal and Business Banking, Craig Bond, says the Hyde Park branch is a blueprint for its branches across the country and eventually across the African continent through its partnership with parent Barclays. “The key element of the Hyde Park branch is that everything is done without any paper in the branch,” Bond explained. He added that by the end of this year, most of the major shopping centres in SA will have Absa branches that have the same look and feel. “The nature of banking is changing for the better. In partnership with Emerge Queue and Qmatic, branches are looking for ways to reset expectations with a total focus on the customer experience,” Swanepoel concludes.